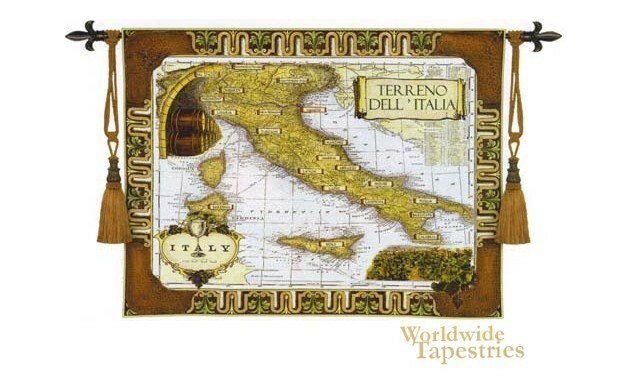 This world map tapestry shows the country of Italy and in particular its wine regions. Italy is one of the European countries well renowned for its wine, and famous regions include Tuscany, Piedmont, Lombardy, Campania, Basilica and Umbria. Their variety of red and white wines are staggering. The countries favorable climate and hundreds of years of wine making tradition and craftsmanship makes for some of the best wines in the world from a region that is considered to be one of the most beautiful as well. In this map we see a map in beige greens and browns with details of terrain markings, region names and made into an art work by rendition of land and land edges and some images of wine barrels and vineyards to emphasize the wine focus of this world map. An ornate border completes the look. This tapestry "Italian Wine Country" is backed with lining and tunnel for ease of hanging. Note: tapestry rod and tassels, where pictured, are purchased separately.